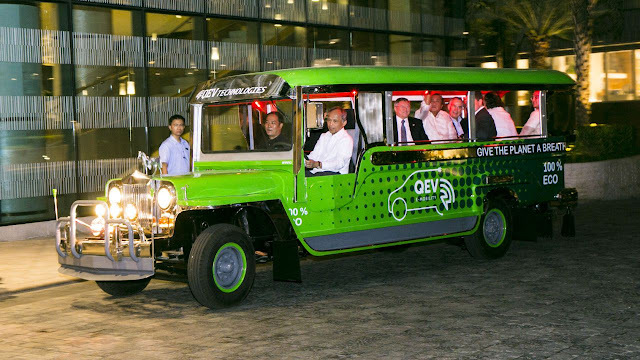 Department of Energy Secretary Alfonso Cusi behind the wheels of the first-ever electric-powered “Green Jeepney” developed by QEV Philippines during their product launch held at the Shangri-La at the Fort in Bonifacio Global City on Thursday, July 20, 2017. QEV Philippines is the electromobility ecosystems company that will set up the first charging station network in the country for electric vehicles. The charging station will have fast chargers that can charge lithium ion batteries for 15 minutes. This will enable the Green Jeepney to run for 100 to 140 kilometers. Using electricity as fuel will be 30 percent less costly than using diesel. The charging infrastructure also translates into $100 million savings in foreign exchange by eliminating the importation of about 375 million liters of oil per year. The Green Jeepney runs on electricity and aims to be a more efficient, clean and modern alternative public transport vehicle. QEV Philippines will be converting jeepneys with internal combustion engines into electric vehicles like what it did to the Green Jeepney. The conversion, to be done in partnership with local manufacturers, can be done in just two hours. Other officials who graced the Green Jeepney launch were Department of Finance Secretary Carlos Dominguez III, Department of Transportation Secretary Arthur Tugade, Department of Public Works and Highways Secretary Mark Villar and Environment and Senate Natural Resources Committee Chairperson Senator Cynthia Villar.